SAN FRANCISCO, 14th of November 2018 — Trifacta, the global leader in data preparation, today announced a new set of capabilities designed to enable data engineers within data operations (DataOps) practices to more efficiently develop, test, schedule and monitor data preparation pipelines in production. With RapidTarget, Trifacta customers can utilize an existing data model to intelligently guide transformations and accelerate the process of generating a new output dataset that matches the predefined schema. Automator provides end-to-end management of scheduling, monitoring and refining preparation workflows. 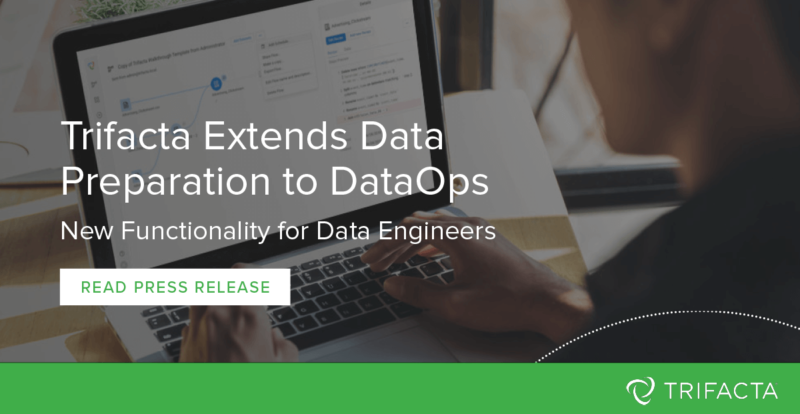 These new features, along with the new Deployment Manager framework, facilitate the work of data engineers in administering data pipelines that feed analytics, machine learning and data science initiatives. DataOps is clearly on the rise, with 73 percent of organizations indicating they planned to invest in the methodology in 2018. In light of this growing adoption of DataOps practices, the role of the data engineer in configuring, managing and scaling data pipelines has risen as a critical position within data management. Trifacta, through its work with large-scale enterprises including New York Life, GlaxoSmithKline and Deutsche Boerse, has seen first-hand how data engineers are a driving force behind the maturation of data preparation from an ad-hoc activity to a standard enterprise data management process. These new features in the Trifacta platform further support the role that data engineers perform in promoting data preparation flows developed by analyst end users into scalable data pipelines that deliver value to the broader organization. RapidTarget: Allows data engineers to set a predefined schema target that provides automated guidance for how diverse data sources must be prepared and joined together in order to map to that target. Aligning the transformation process to an existing data model is critical when integrating unfamiliar or external data into an analysis. RapidTarget offers intelligent suggestions to accelerate how users prep and blend data sources in order to align their output to fit a desired data model. Automator: Trifacta’s system to intelligently manage the scaling, scheduling and monitoring of data prep workflows in production. Users can set the schedule for flows to automatically run in production at a given time, when data updates or programmatically using APIs. Upon scheduling, users can define parameters or variables to customize what data is input into a workflow and how outputs are published. Finally, they can monitor the status and performance of jobs, and set alerts when input data changes or anomalies occur. Deployment Manager: Provides a framework for testing, versioning and managing data preparation workflows as they transition into enterprise-wide data pipelines. Before a new workflow can bring value to the broader organization, the flow must be tested at scale. With Trifacta’s Deployment Manager, data engineers can seamlessly test new workflows across development, testing and staging environments prior to being transitioned into production pipelines. The framework also allows data engineers to manage the versioning of flows and even rollback to prior versions of flows if needed. Learn more about how data engineers are using Trifacta as part of broader adoption of DataOps practices on Trifacta’s blog here.